Stopped at my mom's and found my boxed set, but I'm missing LWatW and The Silver Chair. Not sure if I've got them on my bookshelves somewhere or if they just were read to pieces. This one was my second favorite of the books. It's so exciting! And I was not pleased by the movie version. All of my copies disintegrated. Thinking back, they were pretty flimsy little paperbacks. It’s interesting that you flipped the orientation again. (Sorry I peeked at the original already.) This is a fascinating experiment of image nostalgia. Wierd Nate. I guess I'm your Google filter. 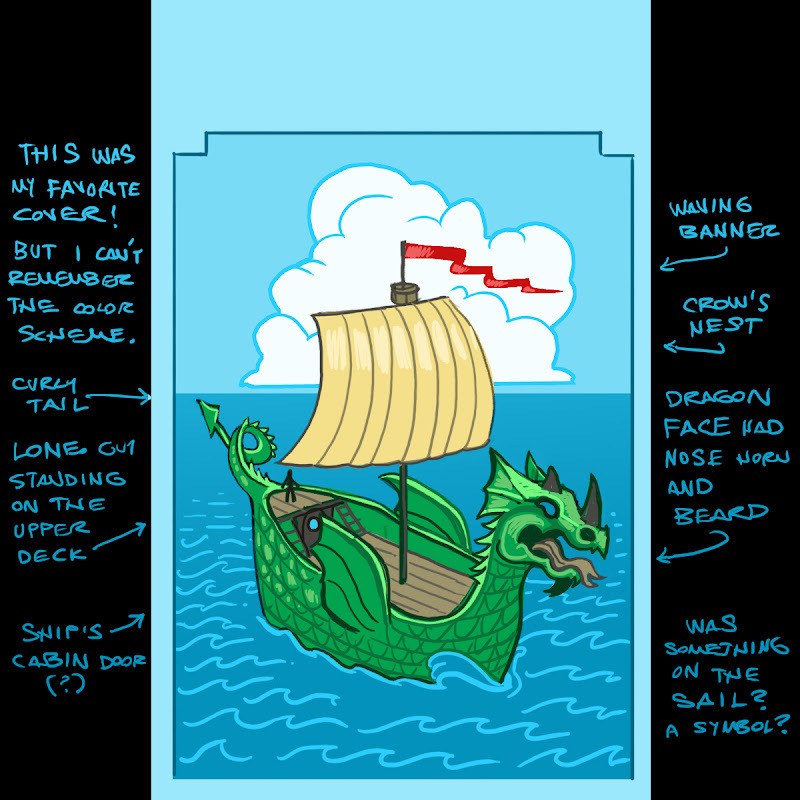 Just so you know, you nailed the basic composition (forgot the sea monster though). And guess what? you flopped the image again! The boat on the other cover travels from right to left! You might start wondering if there is a mirror switch in your brain somewhere? These are impressive! I think you may have been mixing up two of the covers in your mind, though, because the older one doesn't have the curly tail that a newer one does. This book was my husband's least fav as a kid because he thought it was boring. I never read them as a child, and this was one of my favorites, mostly because of that dragon scene. I loved the repentence/baptism aspect of it. When I read these as a kid (or had them read to me) I took them completely at face value. When I found out they were chock-a-block with Sunday School lessons, I felt a little tricked. I felt like C. S. Lewis had pulled a bait and switch. I didn't want a church parable--I wanted a cool story about dragons and talking animals. I still feel that way.